Following up on the most recent post about the New Release Scheduling System, I’m bringing you the news about the new Oxwall Update. According to the new schedule, we have completed the Quality Group Testing last week and are now ready for the public release. This time it is a combination of a major bug sweep operation, as well as the introduction of several key improvements and new features. Enjoy the Update and lets us know what you think in the comments or in the forum. This entry was posted in News, Release and tagged 1.2.4, bugfix by Zima. Bookmark the permalink. Everything will be ok with Grunge theme? becouse there is no update for Grunge. Please, ansver to me 🙂 everything will be ok after the update , i am using grunge theme ,an for grunge theme is no update. So i am ignored, again……… thanks. I’m sorry for the delay. You will have to manually upload the Grunge theme. Only default ones are updated automatically. Got it. Thanks for pointing that out. Much appreciate it. The team is re-uploading it to the store now. The theme is ready. Again, thanks a lot for pointing that out. OH NOOOOO!!! Turn it back turn it back!!!! What have you guys done??? Oh noooo, now, I can’t post videos or pictures, that had been FIXED and now you went back in there and BROKE IT! UGGGGH! Why’d they do this? I don’t get it? 10 steps forward, 5 steps back! No no no no no!!! Dammit, if I had known this – I wouldn’t have updated it, how can I go back? You should be able to go back if you have backed it up. Although I have to say that we have not disabled posting of videos or pictures. Rather it was done through Rich Text in the last version and now you can do it in a more user-friendly way with Attachments. If it doesn’t work, please report it to the support team at the forum. *smh* I am just spinning, who gives a ding-dang-dizzy about iPones and iPads – WYSIWYG worked…it WORKED for what’s most important, people on their computers and people without KNOWLEDGE of how to post. Now, those people, who are the MAJORITY visiting my site, are BACK in the dark and asking me HOW TO??? Totally the wrong move here… totally… and – I could kick myself a hundred times, because I have been backing up every single time I updated – but because I trusted the update, I went and updated without backing up THIS TIME – serves me right – the one time I don’t do it, I regret it – BAM – Murphy’s Law man, Murphy’s law. I HATE that this incredible software has been set-back instead of forward – all for some freakin’ iPhone and iPad that only a FEW people have! Geez! Once again, you should be able to attach photos and videos, just like on the screenshot. Are you sure that beside the platform itself you have updated all of the plugins; more specifically, the Newsfeed? Okay, if it is done via my PROFILE – there you can attach it – I see that. WYSIWYG is still connected to Blogs and the Forum, thank goodness for that, Phew… however, most persons come onto the “MAIN” page of the community and it is from THERE that 99.9% make their comments or comment off of a post that has been made. THAT particular area – in the MAIN area of comments – there is no way to attach pictures or videos – that attribute is GONE. All they can do now is simply comment – can’t add videos – I tried – no deal – can’t add photos, UNLESS you know html and that I’m assuming, I haven’t tested it. However, most all of the members having a CLUE of how to do what I might be able to – which is why I LOVED the small icons that were there for adding photos or videos. I assume that, as usual, there will be an auto-update option shortly? I don’t know why people don’t wait for it like I do – the auto-update is as easy as pie! Great work Oxwall folks – it is very much appreciated! That’s right. The auto-update button will appear in the span of 24 hours after the launch of the update. Thanks Zima – keep up the good work. By the way, if any Oxwall users want me to help with updates etc, I’d be more than happy to help. Just drop me a line using the Contact Us link on my site and explain what your problem is and I’ll do whatever I can to help! Instructions say to unpack update to the root folder of your software install; exactly which folder is it they are referring to. Is this the main folder, or one of the other folders, I have no idea. when they give instructions they need to be more specific, you can’t just assume people know what you are talking about, people can’t read your mind. That’s why so many people are having problems with the updates. Just like instructions say, it should be the same root folder, where you have installed the software. I can’t seem to find an auto update button, I’ve look every place, I can’t find it. Could you tell me exactly where it is suppose to be? The link to the button is hard to miss, as it should appear at the top of your Admin Dashboard. I assume you’ve looked there, so perhaps the problem is with something else. See if this forum topic is of any help. Thanks all for your help, I know sometimes people can get pretty frustrated when they are trying to do something and it’s not working out, lol. I just wanted to remind your crew, that there should be a asterisk next to required questions on profile edit, so people know. They should also give people the option of not showing their age on their profile, that way if it is a required field, they can still choose not to have it displayed. I’m getting kinda old, so I will usually choose not to have it displayed. I’ve forwarded your suggestions to the team. One more suggestion, It should probably default, or an option, for links on the link plug-in to open in a new window or tab. That way you can view a link without having to leave the site. It’s easier to view a link then close the tab, than to have to press the back button, or have to come all the way back after they have viewed the site. I’ve checked the Oxwall Demo Site and attaching photos and videos works fine on the Main page there. Are you sure you have updated all of the plugins? Yep, sure did. Updated the software, updated the theme I’m using as well, and then refreshed it several times. And it does not give an option on the MAIN page, to attach photos or videos. I can do a print screen but there’s no way to attach it here – so I can’t show you. If I go to my Profile page, I can attach in the comment that I make. However, if another member makes a comment and I try and comment on what they’ve said in the MAIN area, all I can do is comment, no where does it show me a means to attach photos or videos. Just to be absolutely sure, have you updated the Newsfeed plugin? This one – http://www.oxwall.org/store/item/43 ? If you have, and attachments still don’t show up, it should be reported on the forum. Hi, I have been using a few themes, Club, Graphite and was hoping for an update to those themes ? would that be possible, I’m sure many people out there are also using some versions also. All of the themes have been updated. Just went to the demo site – yep, you’re right – I can do it there …. so now, the question is, why not at my site? Everything else is working fine and I did the update because the changes are there. Plus, at the My Profile page, I can see the attachment ability… so what’s going on? Now I’m really baffled! I’ve joined your site to see if I can help you – it currently says the account is pending approval so once approved then I will take a look for you. Oh shoot Paul, I wish I had known that, I saw a few new applications and I’m so used to Spammers that I assumed that is what you were and deleted you. Aaaaah, I feel awful, – but all is well now. Totally happy with the way it is. Just try to go in the plugins folder and install the new newsfeed. but it has downloading from the internet first. things just are not working because not to do this correctly .. I did and it works as it should be. I really appreciate the way you all over there at Oxwall keep moving to improve this great product, thanks again. Aaaah, all is now restored to order – once more all correct in SpaceNook universe – today I found updates that took platform from version 4227 to 4230 – AND – multiple plugin updates… after doing them… ALL is as it should be. Tested everything… hmmm, well – it’s all the way you guys updated it to be, but in truth, it was better before – I and the visitors had control over putting smilies and other captions RIGHT IN the post, now as an attachment, doesn’t look good. Oh well… it is what it is..
oEmbed compatibility for the Newsfeed (pasting a link into the Newsfeed will now generate a summary with title, picture or video, like in Facebook or Google+) is not very good, becouse then you post the link it generates first image from web page, for example: very small twiter image , sing in icon ,very first imige from web page. Yes, we are aware of that. The issue will be addressed in the near future. Thank for the report, I have forwarded it to the Development Team. If you want to see the progress on the issue, please set up a topic in our forum. It should be in the Admin Dashboard. Installed, now newsfeed wont allow new text to be added, no button, pressing enter just makes a new line, uninstalled (updated) newsfeed, have lost ALL TIMELINE, not impressed. Since the beginning of the site. now reinstalled, still not working, I am on 1.2.4 core update did today. please help. Please report this on our support forum. So where do i register to post on the support forum ??? You can log-in at the top of the page using your registration details or Facebook Connect. Thank you for the suggestion, we will add it shortly. Hey, just wanted to add that I am super-impressed and thankful for all the great work on Oxwall. Have i not found it or is there no way to moderate groups (make it private)? Thanks again!! That feature is currently unavailable, but it will be implemented in one of the upcoming updates. Deep thinking – adds a new dmienoisn to it all. If you have a problem with pictures not showing up on your page, please report it in the forum. Also, Oxwall is Open Source, so we don’t sell licenses. Hi. I cant join to the site. i think its a issue on captcha field! Might be a bug. Report it on the forum with additional details. n i found this place to report it. I have forwarded your report to the team, but please do try to get on the forum, as that’ll speed up the process greatly. You can log in on the forum using Facebook Connect. 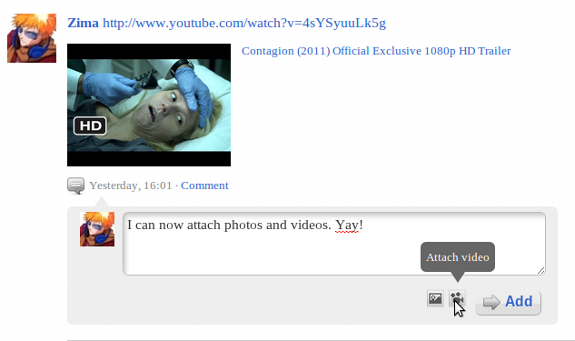 I tried updating the site twice, when I tried commenting and embedding video, I got description but no video. It just shows the code. I tried the link to the video, the old embed code, and the new. It doesn’t work. And I know that I updated the site the way I was suppose to. I am going to leave my site the way it is. It’s good enough I suppose. I can always make my own improvements. I will make some donations to your Oxwall, for the website. But I’m probably not going to try updating again. Even if I do back it up, I still run the risk of the site not working right.. Sorry to hear that something does not work. It should. Please report it on the forum and we’ll help you. Also, if you have trouble updating your site manually, just wait for the auto-update next time. I recently set up my forums. Maybe… 2 weeks ago, give or take. I’m going to gather, I’m running the most current version then. I can’t add videos or pictures to comments in the news feed. The buttons are there to do it, you can upload, and add embedded code, but you can’t select add or send with the image or video there. Any thoughts on why this is occurring? Should work. Report this on the forum. I’m helping the creator of the site with some issues. One in which pictures are not viewable. I’ve been told that it is because the photo directory for users is missing. But i can sure use some help. Have you tried the forum?